Marcia, affectionately known as "Cia", was born and raised on the Peninsula. She graduated from Warwick High School in the Peninsula's first graduating class of the International Baccalaureate Program, receiving the full IB Diploma and Advanced Studies Diploma (1998). Price attended Spelman College and received her Bachelor of Arts degree in Philosophy, with intensive study in Biology (2002). She also received her Master of Arts in Religious Studies from Howard University (2005). Price has completed some coursework toward her Master of Divinity Degree at Howard University (2011-2013). With each program, she focused on learning as much as she could in order to return home to make a positive difference. Price worked as a special assistant in the Virginia Liaison Office under then Governor Mark Warner and as a state coordinator for the NAACP This Is My Vote! Campaign for voter registration, education, and mobilization. After what was supposed to be a month long internship at a dental office, Price enjoyed an almost 10 year career of dental office administration and management because she was passionate about helping people get the care that they needed. In September 2016, as a project of New Virginia Majority, Price worked to start the Virginia Black Leadership Organizing Collaborative (VA BLOC), a non-profit focused on "building empowered communities" through integrated voter engagement, civic involvement, and leadership development, where she serves as Director. Cia is a member of St. Augustine’s Episcopal Church and has been active in organizations like Alpha Kappa Alpha Sorority, Inc., People to People, Virginia Center for Inclusive Communities, and Congressman Bobby Scott’s Young Professionals Advisory Council. She currently serves on the Board for Habitat for Humanity serving the Peninsula and Greater Williamsburg. 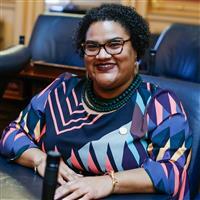 She previously served on the Downing Gross Cultural Arts Center Advisory Board and the Newport News Commission on Youth, also previously serving on the Virginia Council on Women, having been appointed by Gov. Terry McAuliffe. Del. Price has received several honors, including the 2017 Marguarite Adams Award for Political Action from the Mid-Atlantic Region of Alpha Kappa Alpha Sorority, Inc., the 2017 Community Service Award from the Hampton Democrats, the 2017 Community Service Award from Zeta Lambda Chapter of Alpha Phi Alpha Fraternity, Inc. She was named Greek of the Year for the Lambda Omega Chapter of Alpha Kappa Alpha Sorority, Inc. (2009, 2011). Also, she received the 2017 Solid as a Rock Award from the Virginia Education Association for her strong support of public education. In 2018, she was named the 2018 Champion of College Affordability by Partners for College Affordability and Public Trust. On November 7, 2017, she was reelected for her second term to represent the 95th District in the Virginia House of Delegates. She serves on the Health, Welfare, and Institutions Committee (Subcommittee #1), the Privileges and Elections Committee (Subcommittee #3), and the General Laws Committee (Subcommittee #2). She currently serves as Secretary of both the House Democratic Caucus and the Virginia Legislative Black Caucus. Del. Price is a member of the Hampton Roads Caucus, the Gun Violence Prevention Caucus, the National Conference of State Legislators, and the National Black Caucus of State Legislators. Del. Price loves interacting with her constituents and has been called upon to give speeches to help awaken audiences to the needs of the community and to inspire them toward action. As a fourth generation resident of the Peninsula, Del. Price embraces her family's legacy of service and strives to make a positive impact in the Peninsula community that has given so much to her.